We think that any parent who chooses to carry their baby has made a fantastic, positive decision for themselves and their child, whatever carrier they choose to use. However, based on our experience, there are some types of carriers that may not be as comfortable, practical, safe or cost effective in the long run as others. Carriers that are very cheaply made to poor standards of quality and safety. See our page about Unsafe Carriers and Illegal Fakes. Advertised weight ranges generally represent what a carrier has been strength tested to withstand and not necessarily what age child it’s practical or comfortable to carry. Though we do feel that many cheaper carrier models reflect their price in noticabley lower levels of comfort and longevity, the reverse is not always true for those at the more expensive end of the market. The best way to know whether a carrier will meet your needs and be comfortable and easy for you to use is to try one out before buying. 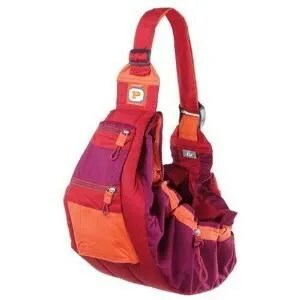 Bag Style Slings are usually adjustable slings that have a deep pocket with elastic or cords to tighten the sides, and a strap to go over parents shoulder or across their body. These are advertised as being suitable for all ages, depending on carrier position. These appear superficially similar to ring slings or pouches in design, but they have a deeper pocket and a more enclosed opening creating a potential suffocation hazard.